Giving your children's bedroom a bit of a refresh couldn't be easier. It could be as simple as adding new decorations, or even adding a statement rug/bedding. We think that one way to refresh a bedroom is be to add some cute and quirky bunting to the walls, or bed. Bunting can be hung from pretty much anywhere in a bedroom, creating an extra dimension and adding a splash of colour to a bedroom. If your child has a four poster bed, hanging bunting from the posts can give your little one something to look up at when they are drifting to sleep. 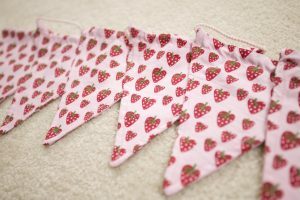 We supply a range of colourful bunting that is sure to fit with any theme. Another way to add bunting to a bedroom is by adding it to the wall, placing the bunting high on the wall will create a boarder around a bedroom, again adding interesting decorations and creating an exciting feature. Adding bunting to book shelves can give plain shelves a new lease of life. This is a great way to revamp small pieces of furniture, not only will the bunting add a splash of colour it will also transform furniture making it look brand new and exciting.